When you are contributing to a book, communication is a vital part of the process, whether you are working locally in the same physical space, or remotely online. 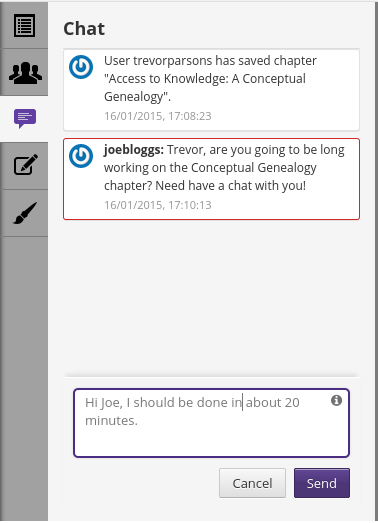 Booktype assists collaborative working with live user status listings, chat messages and system notifications. 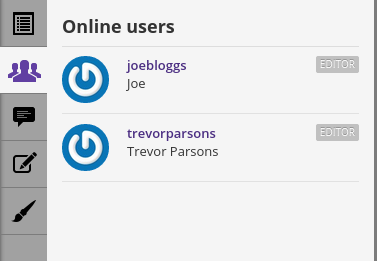 Click on the Online users tab to see who is working on the book alongside you. Each username is a link to the user's profile page. The Chat tab enables you to chat in 'instant messaging' style with the other people who are working on the book, using the field at the lower end of the tab. Type the message and click the Send button for the message to be delivered to all contributors who are currently editing. This tab also provides real-time system notifications about what's happening with the book. Chat messages are not persistent, so users will only see the messages that have been sent since they began editing the book. As well as the Chat tab, system notifications are also visible on the Book history tab. For an explanation of Book history, see the chapter The Edit Interface. 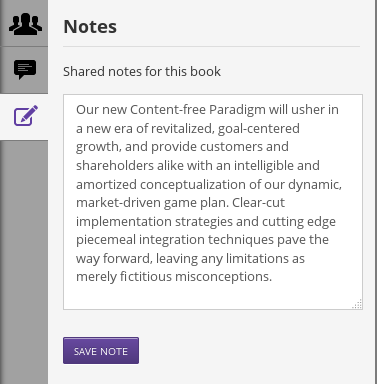 The Notes tab is a simple notepad visible to everyone who is working on the book, intended for sharing text snippets and general tips. Unlike messages in the real-time Chat tab, these notes are persistent and are saved with the book, although they will not be present in the published output. This persistence means that contributors who are not currently working on the book will have a chance to read these notes later. You must click the SAVE NOTE button in order to save changes to notes.